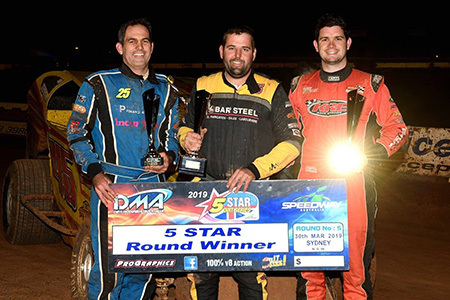 For Jai Stephenson it was an historic career first Valvoline Raceway A-Main victory where he led home former national champion Andrew Pezzutti in second place and David Clark home in third in the 5-Star Dirt Series feature race round. For 18 year old Kaidon Brown it was a hat-trick of main event wins after successes at VR earlier the month and then at Murray Bridge Speedway (SA) for the last two Ultimate Speedway Challenge rounds. Michael Stewart had a welcome return to the podium for second place (leading until the final lap) and Glen Arnold recorded a career-best third place finish in his Mopar. For Chris Marino it was a satisfying victory in the Street Stockers over the always fast Shaun Davoodi in second place and an elated Troy Dawes home in third place. It was a rewarding night for the Dawes family with Troy in third and Butch coming home in sixth place.